The Vegan Cookie Connoisseur contains 140 recipes that range from simple everyday cookies to fancy special occasion cookies. The book is broken up into 13 Chapters (How to Be a Cookie Connoisseur, Cookies Inspired by Drinks, Totally Nuts and Seeds!, Blissfully Chocolate Cookies, No Bakes, DIY Versions of Mass Produced Cookies, Fruity Cookies, Bar Cookies, A Take on Tradition, Healthier Cookies and Baking for Specific Needs, Nostalgia: Everyones Favorite Cookies, Cookies You Would Find at a Tea Party, and, Decorating: Ideas and Recipes for Homemade Cookie Fixin’s). The book also includes an index and a conversion chart. I wasn’t really sure what to expect when I received this book. I was hoping for new and exciting recipes, but expecting to be disappointed with unimaginative recipes. I didn’t know anything about the author. All I knew was that I’ve seen a lot of vegan dessert books lately and while they all contain some tasty looking recipes, they aren’t anything that hooks me and I don’t feel like I need them for my collection. The Vegan Cookie Connoisseur, however, was a pleasant and exciting surprise. Though I received this book for review, there is no doubt in my mind that I would have purchased it had I seen it on the shelves of my local book store. The photographs are inviting and while some ground is retread, there are a lot of new recipes that I was very excited to try. It seemed like every other page made me want to crack out my mixing bowls and measuring cups in order to get baking. Among the must-try recipes are: Spicy Mexican Hot Chocolate Cookies, Root Beer Float Cookies, Vanilla Wafer Cookies (the Nabisco Vanilla Wafers were my favorite cookies as a kid! ), Graham Crackers, English Toffee Squares, Peanut Butter Cups & more! 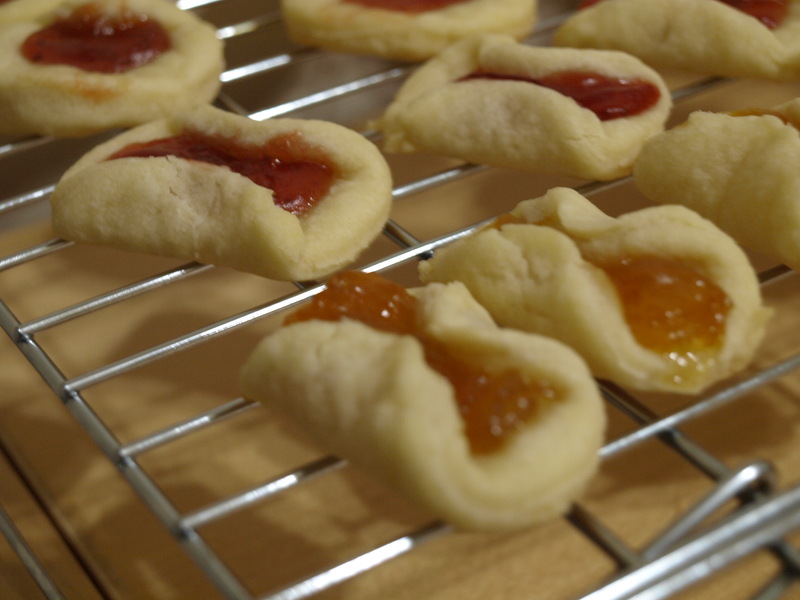 The first cookies I tried out of the book were the Giant Bakery-Style Double Chocolate Cookies, which weren’t quite as chocolaty as I’d hoped, but they were still good and the Jam Kolaches (another childhood favorite – see recipe below). I could eat Miss Peloza’s Jam Kolaches everyday. I made them with three different types of jam: strawberry, black cherry, and apricot. I even made some for my friend, Ralph as a birthday gift and shared the extras with the guests at his party and they were a hit! I was impressed when I found out that Miss Peloza is merely a college student studying art in Milwaukee, WI. Being a published author at 19 is quite the accomplishment! Aside from containing a bevy of tempting recipes, The Vegan Cookie Connoisseur, also contains helpful tips and inforation, like ways in which variations can be made to recipes, how to bake for people with allergies, tips on baking with a toaster oven and more. Miss Peloza’s instructions are clear, the recipes are easy to make and so far every recipe I’ve made hasn’t contained any ingredients which are hard to find, which is always a plus in my book. So if you’re a cookie lover (and really, who isn’t?) make sure to pick up The Vegan Cookie Connoisseur this winter. Kelly Peloza is also the author of the Vegan Cookzine Vegan Candyland and writes the blogs: Vegan Cookies and Seitan Beats Your Meat. Beat together the margarine and cream cheese with an electric mixer until smooth. Sift in the flour and stir until incorporated. Don’t mix too much or the dough might be a bit gummy. Cut 2-inch circles out of the dough with a glass, cup or cookie cutter with a 2-inch diameter. If you can’t find anything, a knife works fine, too, but it’s a little more time-consuming. Plop a heaping 1/4 teaspoon jam in the center of each circle. It’s tempting to add more, but it will melt all over the cookie and onto the tray when baked (personal experice!). Fold two opposite sides of each cookie to the middle so that the edges touch. Bake for 13-15 minutes or until firm, then remove from the oven and sprinkle with the powdered sugar, preferably using a sifter to make them look pretty. Transfer to cooling rack and eat! Melisser Elliott, founder of Sugar Beat Sweets and Urban Housewife author’s recent book, The Vegan Girl’s Guide to Life, is a must read for every girl looking to live a cruelty free life. When I first received the book I was a bit surprised by it’s size. I was expecting a larger tome, but I was pleasantly surprised upon cracking the cover. Ms. Elliott has compiled a plethora of information for the 21st century vegan girl which is clear, concise, aesthetically appealing and entertaining. The Vegan Girl’s Guide to Life covers everything from the basic to the complex. The book is broken down into 7 chapters: Understanding What Vegan Is (And Isn’t), Nutrition, Vegan Living, Shopping Like a Vegan When You’re Not Buying Food, Vegan Food, Get Started in the Kitchen: Recipes and Do It Yourself! Short profiles of ordinary vegans and not so ordinary vegans are sprinkled throughout the book. Among the not so ordinary are Chicago’s very own, Leanne Mai-Ly Hilgart of Vaute Couture, and Laviyah of Ste Martaen, as well as several other prominent vegan business women. Elliott begins the book by describing how she became a vegan, before she goes into veganism basics. Unless you’re new to veganism you can probably skip the first chapter which is filled with facts and myth debunking. If you’re a seasoned vegan you can probably also skip the second chapter, which covers nutrition, however, if you’re newer to veganism, like myself, you’ll find it’s a nice refresher (I find having occasional reminders about nutrition helps me stay on the right track, kind of like going to the dentist twice a year reminds me why I have to floss – even if it is kind of a pain). The third chapter covers everything from fielding questions about your choices to eating out/traveling to getting a 100% vegan tattoo (I knew most inks weren’t vegan, which is why I haven’t been inked yet, but now I’ll be ready if/when I decide to go for it)! “Shopping Like a Vegan When You’re Not Buying Food” (Ch. 4) was by far my favorite chapter. I learned about so many companies that offer vegan products without having to search/sift through the internet for hours. The chapter covers clothing, beauty products (Top 10 Lists by both Elliott and Sunny Subramanian, editor of Vegan Beauty Review), feminine products, cleaning products, and condoms/birth control (however, the book is short, so don’t expect to find info on everything, though it comes close!). Chapters 5 & 6 cover food, the former offers tips on stocking your kitchen & pantry, non-vegan ingredients to watch out for, vegan substitutes and cooking tips, while the latter offers a wide variety of recipes, including contributions from authors, Kelly Peloza (The Vegan Cookie Connoisseur) and Terry Hope Romero (Viva Vegan!, Veganomicon, etc.). Ms. Elliott closes the book with a chapter called, “Do It Yourself!”, I felt some of the information was a bit superfluous (but fun), like the crafts she includes. However, some of the sections within the final chapter were very informative, like the gardening section and the knitting/crochet section (knitting warm vegan items is possible despite what wool purists might tell you). My only complaints about The Vegan Girl’s Guide to Life are the book’s lack of an index and the ordinary vegan girls’ profiles. Almost everyone profiled has a blog or website listed, unfortunately, some of these links are no longer active. Also, though it was cool to see the similarities and differences between vegans, the profiles would’ve been more relevant to would-be-vegans & current vegans if they contained recommendations or tips, as opposed to the “Funniest Vegan Moment” sections, as many of these weren’t funny. That being said, I found many of the noteworthy vegan girl’s profiles to be very inspiring. So whether you’re a seasoned vegan, an aspiring vegan or simply curious about the vegan lifestyle, you should check out The Vegan Girl’s Guide to Life.